This extensive suite (9mx6m) offers deluxe accommodation incorporating a stylish bedroom and open plan lounge. The spacious outside deck area is perfect for intimate dining and guests have the option of cooling down in the huge plunge pool. They incorporate a stone walled bathroom with double sink and shower. In room fridge & safe. Fundu Lagoon is on Pemba Island, which is part of the Zanzibar archipelago and lies to the north of its larger, better known sister island, Unguja. The hotel is situated on a remote and beautiful beach on the south western side of Pemba, and is only accessible by boat. 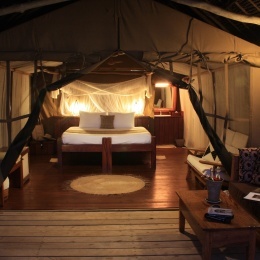 There are eighteen rooms, consisting of canvas tents set under makuti (thatch) roofs on wooden decks, all with views over the sea. The rooms are equipped with large double or twin beds, mosquito nets, ceiling and standing fans, and indoor and outdoor seating areas. Each has an ensuite bathroom with fresh hot water shower, toilet and basin. The rooms are connected to the main buildings by wooden walkways or paths through indigenous forest. Some rooms are situated along the beachfront and the remaining on the hillside, which have wide views over the lagoon. Two of our eighteen rooms are suites, with their own private chill out deck and plunge pool, and four are superior suites which also have an extensive indoor and outdoor lounge space and mezzanine platform. sandy beach. There are three bars, one of which is situated a third of the way along a long jetty which stretches way out into the sea. Fundu is the epitome of a "bare foot paradise" with a distinct Robinson Crusoe air in a remote and peaceful location. It is a place for guests to relax and unwind in casual, yet stylish surroundings. For the ultimate in stress relief you can visit our treatment room where a variety of massage and beauty therapies are available. Fundu Lagoon is suitable for children 12 years and above. Transfers by minibus and boat are $45 per person each way. This can be settled in resort. Partner goes free on local flights and transfers (Dar - Pemba or Zanzibar - Pemba) - valid for stays up to 30th June 2014.